Orthodontic Services Greeley: Why is Early Orthodontia Necessary? 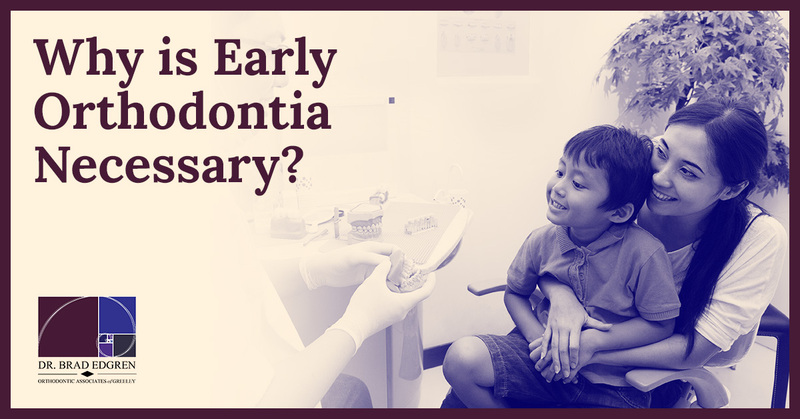 Why is Early Orthodontia Necessary? Why Does My Kid Need an Orthodontist? As a parent, this is an understandable question to ask. After all, aren’t braces for teenagers? This is a common misunderstanding, as anyone and at any age, can need an orthodontist. For children, however, orthodontists are needed to help guide their teeth and jaw into place. Though teenagers are typically the ones with braces, younger children can have them too. In fact, it is better is some ways to have a smaller child have braces because the braces will be acting a preventative measure for their teeth. For some teenagers, braces are a means to fix a problem with their teeth that has been visible for years. By attending to your child’s teeth early, you can limit dental problems that will need to be resolved when they are older. For example, if your child has a severe misalignment in their teeth or jaw correcting that issue as soon as possible is important. Not only it is it preventative from more severe issues, but it resolves the problem quickly. In this blog, we will discuss some of the warning signs that might clue you in to get your child an orthodontist appointment. We also will discuss why early treatment is the best option for your child, rather than waiting for their teen years. Determining whether a child needs dental care can be a challenge, as one of the main ways to determine if dental care is needed if teeth suddenly become loose and fall out. Of course, missing teeth is expected in a child’s smile, so this is not always the best determinate that a child needs orthodontic services. If your child has any of the above symptoms, they will need orthodontic care. And, if your child ever complains about difficulty chewing, speaking, or breathing, it is extremely important to see an orthodontic specialist. Regardless of whether you believe their teeth are well aligned or not, getting a professional opinion is recommended. After all, even if your child’s teeth look decent now, teeth can move very quickly into odd positions. By giving your child early treatment, they won’t have to worry about the alignment of their teeth. Instead, they will be happy that their teeth were attended to before they became a bigger and much more noticeable problem. When you are a young child, you don’t think too much about your image. This innocence is what makes childhood so enjoyable — vanity doesn’t affect you. Unfortunately, as we age, what we look like becomes increasingly important. When it comes to teeth, it is one of the first things a person will notice about you. If you have poorly aligned teeth, with no sense of structure, this can be considered displeasing to the eye. But, if you get braces or any other orthodontic treatment, you could save yourself a lot of grief. In the case of your children, scheduling them for orthopedic services now may help them build confidence in themselves for the future. If you are interested in scheduling your child for an orthodontic appointment, contact our office today!